The Distribution Fitter app provides a visual, interactive approach to fitting univariate distributions to data. 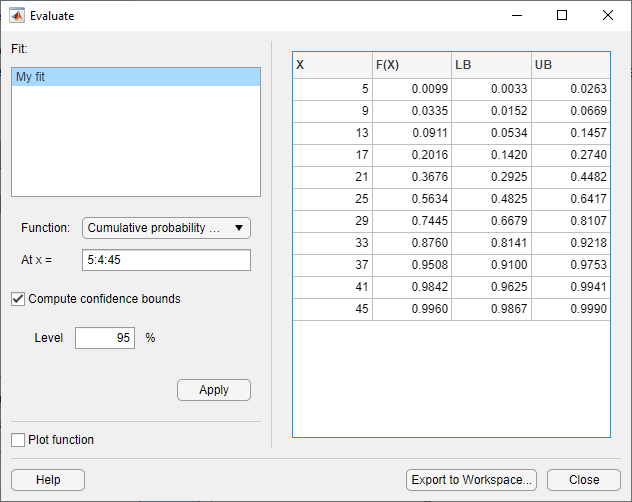 You can use the Distribution Fitter app to interactively fit probability distributions to data imported from the MATLAB® workspace. You can choose from 22 built-in probability distributions, or create your own custom distribution. The app displays the fitted distribution over plots of the empirical distributions, including pdf, cdf, probability plots, and survivor functions. 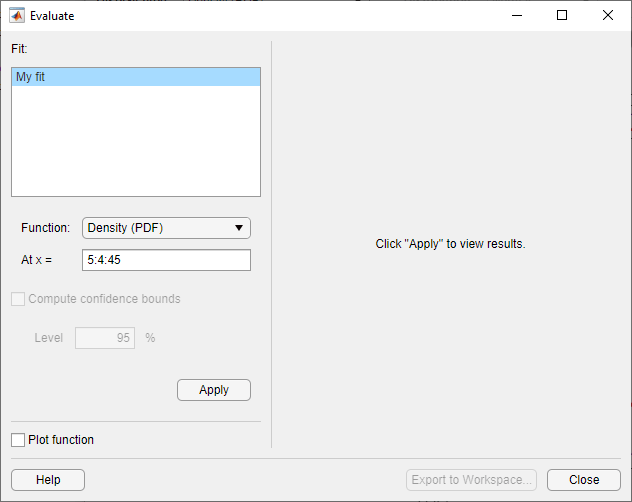 You can export the fit data, including fitted parameter values, to the workspace for further analysis. On the MATLAB Toolstrip, click the Apps tab. In the Math, Statistics and Optimization group, open the Distribution Fitter app. Alternatively, at the command prompt, enter distributionFitter. Import your sample data, or create a data vector directly in the app. You can also manage your data sets and choose which one to fit. See Create and Manage Data Sets. Create a new fit for your data. See Create a New Fit. Display the results of the fit. You can choose to display the density (pdf), cumulative probability (cdf), quantile (inverse cdf), probability plot (choose one of several distributions), survivor function, and cumulative hazard. See Display Results. You can create additional fits, and manage multiple fits from within the app. See Manage Fits. Evaluate probability functions for the fit. You can choose to evaluate the density (pdf), cumulative probability (cdf), quantile (inverse cdf), survivor function, and cumulative hazard. See Evaluate Fits. Improve the fit by excluding certain data. You can specify bounds for the data to exclude, or you can exclude data graphically using a plot of the values in the sample data. See Exclude Data. Save your current Distribution Fitter app session so you can open it later. See Save and Load Sessions. 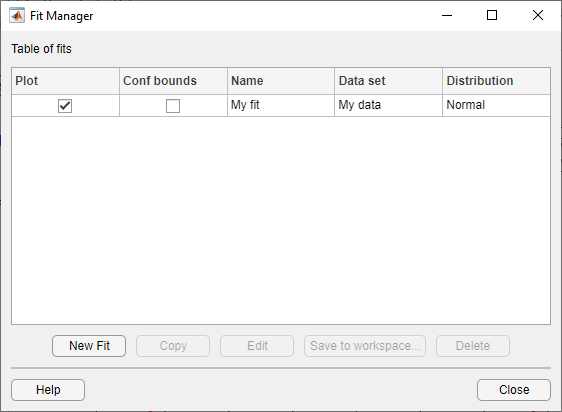 To open the Data dialog box, click the Data button in the Distribution Fitter app. Create a data set by importing a vector from the MATLAB workspace using the Import workspace vectors pane. 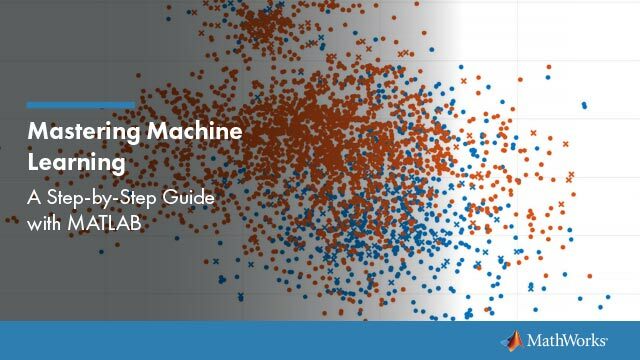 Data — In the Data field, the drop-down list contains the names of all matrices and vectors, other than 1-by-1 matrices (scalars) in the MATLAB workspace. Select the array containing the data that you want to fit. The actual data you import must be a vector. If you select a matrix in the Data field, the first column of the matrix is imported by default. To select a different column or row of the matrix, click Select Column or Row. The matrix displays in the Variables editor. You can select a row or column by highlighting it. Alternatively, you can enter any valid MATLAB expression in the Data field. When you select a vector in the Data field, a histogram of the data appears in the Data preview pane. Censoring — If some of the points in the data set are censored, enter a Boolean vector of the same size as the data vector, specifying the censored entries of the data. A 1 in the censoring vector specifies that the corresponding entry of the data vector is censored. A 0 specifies that the entry is not censored. If you enter a matrix, you can select a column or row by clicking Select Column or Row. If you do not have censored data, leave the Censoring field blank. Frequency — Enter a vector of positive integers of the same size as the data vector to specify the frequency of the corresponding entries of the data vector. For example, a value of 7 in the 15th entry of frequency vector specifies that there are 7 data points corresponding to the value in the 15th entry of the data vector. If all entries of the data vector have frequency 1, leave the Frequency field blank. Data set name — Enter a name for the data set that you import from the workspace, such as My data. After you have entered the information in the preceding fields, click Create Data Set to create the data set My data. View and manage the data sets that you create using the Manage data sets pane. When you create a data set, its name appears in the Data sets list. The following figure shows the Manage data sets pane after creating the data set My data. Select the Plot check box to display a plot of the data in the main Distribution Fitter app window. When you create a new data set, Plot is selected by default. Clearing the Plot check box removes the data from the plot in the main window. You can specify the type of plot displayed in the Display type field in the main window. The Distribution Fitter app cannot display confidence bounds on density (PDF), quantile (inverse CDF), or probability plots. Clearing the Bounds check box removes the confidence bounds from the plot in the main window. View — Display the data in a table in a new window. Set Bin Rules — Defines the histogram bins used in a density (PDF) plot. Rename — Rename the data set. Delete — Delete the data set. 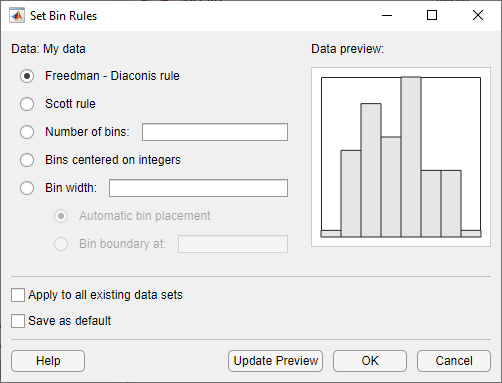 To set bin rules for the histogram of a data set, click Set Bin Rules to open the Set Bin Width Rules dialog box. Freedman-Diaconis rule — Algorithm that chooses bin widths and locations automatically, based on the sample size and the spread of the data. This rule, which is the default, is suitable for many kinds of data. Scott rule — Algorithm intended for data that are approximately normal. The algorithm chooses bin widths and locations automatically. Number of bins — Enter the number of bins. All bins have equal widths. Bins centered on integers — Specifies bins centered on integers. Automatic bin placement — Place the edges of the bins at integer multiples of the Bin width. Bin boundary at — Enter a scalar to specify the boundaries of the bins. The boundary of each bin is equal to this scalar plus an integer multiple of the Bin width. Apply to all existing data sets — Apply the rule to all data sets. Otherwise, the rule is applied only to the data set currently selected in the Data dialog box. Save as default — Apply the current rule to any new data sets that you create. You can set default bin width rules by selecting Set Default Bin Rules from the Tools menu in the main window. Click the New Fit button at the top of the main window to open the New Fit dialog box. If you created the data set My data, it appears in the Data field. Fit Name Enter a name for the fit. Select the data set to which you want to fit a distribution from the drop-down list. Select the type of distribution to fit from the Distribution drop-down list. 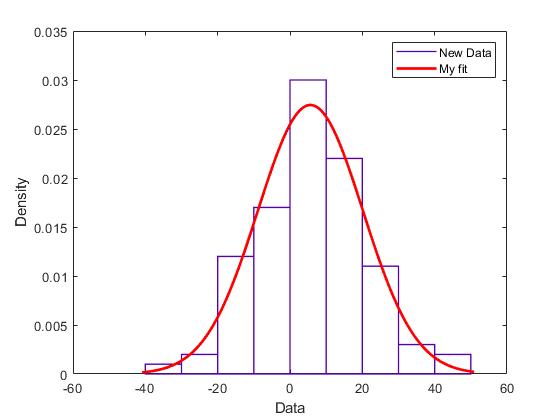 Only the distributions that apply to the values of the selected data set appear in the Distribution field. For example, when the data include values that are zero or negative, positive distributions are not displayed . You can specify either a parametric or a nonparametric distribution. When you select a parametric distribution from the drop-down list, a description of its parameters appears. Distribution Fitter estimates these parameters to fit the distribution to the data set. If you select the binomial distribution or the generalized extreme value distribution, you must specify a fixed value for one of the parameters. The pane contains a text field into which you can specify that parameter. When you select Nonparametric fit, options for the fit appear in the pane, as described in Further Options for Nonparametric Fits. 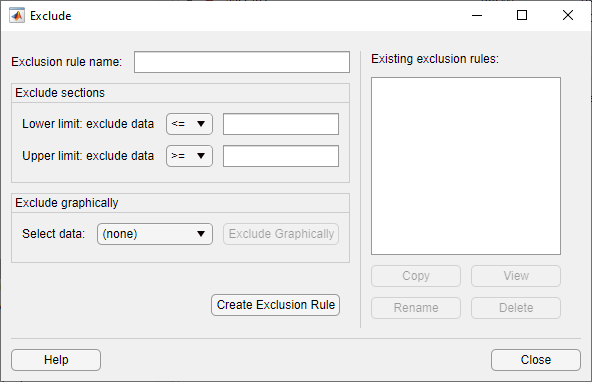 Exclusion rule Specify a rule to exclude some data. Create an exclusion rule by clicking Exclude in the Distribution Fitter app. For more information, see Exclude Data. Click Apply to fit the distribution. For a parametric fit, the Results pane displays the values of the estimated parameters. For a nonparametric fit, the Results pane displays information about the fit. When you click Apply, the Distribution Fitter app displays a plot of the distribution and the corresponding data. When you click Apply, the title of the dialog box changes to Edit Fit. You can now make changes to the fit you just created and click Apply again to save them. After closing the Edit Fit dialog box, you can reopen it from the Fit Manager dialog box at any time to edit the fit. After applying the fit, you can save the information to the workspace using probability distribution objects by clicking Save to workspace. All of the distributions available in the Distribution Fitter app are supported elsewhere in Statistics and Machine Learning Toolbox™ software. You can use the fitdist function to fit any of the distributions supported by the app. Many distributions also have dedicated fitting functions. These functions compute the majority of the fits in the Distribution Fitter app, and are referenced in the following list. Other fits are computed using functions internal to the Distribution Fitter app. Not all of the distributions listed are available for all data sets. The Distribution Fitter app determines the extent of the data (nonnegative, unit interval, etc.) 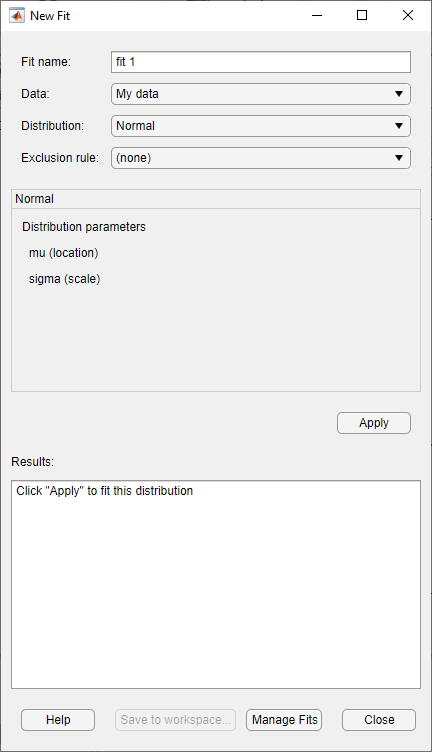 and displays appropriate distributions in the Distribution drop-down list. Distribution data ranges are given parenthetically in the following list. Beta (unit interval values) distribution, fit using the function betafit. Binomial (nonnegative integer values) distribution, fit using the function binopdf. Burr Type XII (positive values) distribution. Exponential (nonnegative values) distribution, fit using the function expfit. Extreme value (all values) distribution, fit using the function evfit. Gamma (positive values) distribution, fit using the function gamfit. Generalized extreme value (all values) distribution, fit using the function gevfit. Generalized Pareto (all values) distribution, fit using the function gpfit. Inverse Gaussian (positive values) distribution. Lognormal (positive values) distribution, fit using the function lognfit. Negative binomial (nonnegative integer values) distribution, fit using the function nbinpdf. Nonparametric (all values) distribution, fit using the function ksdensity. Normal (all values) distribution, fit using the function normfit. Poisson (nonnegative integer values) distribution, fit using the function poisspdf. Rayleigh (positive values) distribution using the function raylfit. t location-scale (all values) distribution. Weibull (positive values) distribution using the function wblfit. When you select Non-parametric in the Distribution field, a set of options appears in the Non-parametric pane, as shown in the following figure. Kernel — Type of kernel function to use. Bandwidth — The bandwidth of the kernel smoothing window. Select Auto for a default value that is optimal for estimating normal densities. After you click Apply, this value appears in the Fit results pane. Select Specify and enter a smaller value to reveal features such as multiple modes or a larger value to make the fit smoother. Domain — The allowed x-values for the density. Unbounded — The density extends over the whole real line. Positive — The density is restricted to positive values. Specify — Enter lower and upper bounds for the domain of the density. When you select Positive or Specify, the nonparametric fit has zero probability outside the specified domain. The data sets for which you select Plot in the Data dialog box. The fits for which you select Plot in the Fit Manager dialog box. 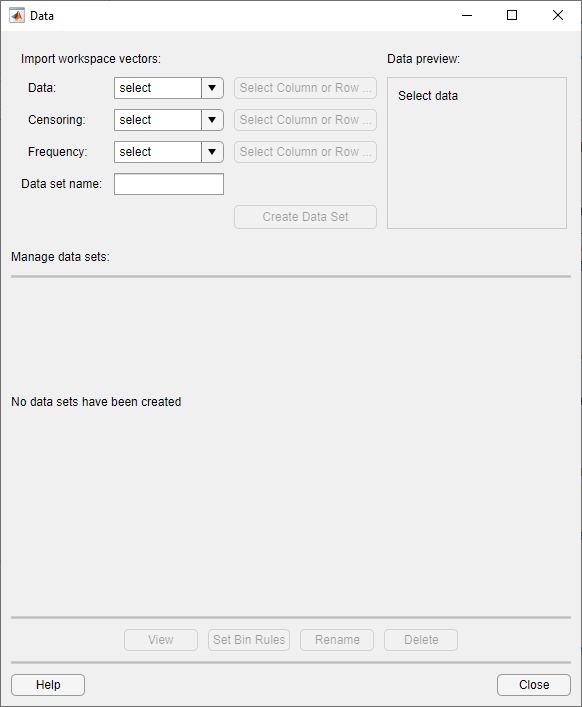 The data sets for which you select Bounds in the Data dialog box. The fits for which you select Bounds in the Fit Manager dialog box. — Toggle the legend on (default) or off. — Toggle grid lines on or off (default). — Restore default axes limits. The following fields are available. Density (PDF) — Display a probability density function (PDF) plot for the fitted distribution. The main window displays data sets using a probability histogram, in which the height of each rectangle is the fraction of data points that lie in the bin divided by the width of the bin. This makes the sum of the areas of the rectangles equal to 1. Cumulative probability (CDF) — Display a cumulative probability plot of the data. The main window displays data sets using a cumulative probability step function. The height of each step is the cumulative sum of the heights of the rectangles in the probability histogram. Quantile (inverse CDF) — Display a quantile (inverse CDF) plot. You can also create a probability plot against a parametric fit that you create in the New Fit pane. When you create these fits, they are added at the bottom of the Distribution drop-down list. Survivor function — Display survivor function plot of the data. Cumulative hazard — Display cumulative hazard plot of the data. If the plotted data includes 0 or negative values, some distributions are unavailable. You can display confidence bounds for data sets and fits when you set Display Type to Cumulative probability (CDF), Survivor function, Cumulative hazard, or, for fits only, Quantile (inverse CDF). To display bounds for a data set, select Bounds next to the data set in the Data sets pane of the Data dialog box. To display bounds for a fit, select Bounds next to the fit in the Fit Manager dialog box. Confidence bounds are not available for all fit types. To set the confidence level for the bounds, select Confidence Level from the View menu in the main window and choose from the options. Click the Manage Fits button to open the Fit Manager dialog box. Plot — Displays a plot of the fit in the main window of the Distribution Fitter app. When you create a new fit, Plot is selected by default. Clearing the Plot check box removes the fit from the plot in the main window. The Distribution Fitter app cannot display confidence bounds on density (PDF) or probability plots. Bounds are not supported for nonparametric fits and some parametric fits. Clearing the Bounds check box removes the confidence intervals from the plot in the main window. New Fit — Open a New Fit window. Copy — Create a copy of the selected fit. Edit — Open an Edit Fit dialog box, to edit the fit. You can edit only the currently selected fit in the Edit Fit dialog box. To edit a different fit, select it in the Table of fits and click Edit to open another Edit Fit dialog box. Save to workspace — Save the selected fit as a distribution object. Delete — Delete the selected fit. Use the Evaluate dialog box to evaluate your fitted distribution at any data points you choose. To open the dialog box, click the Evaluate button. Fit pane — Display the names of existing fits. Select one or more fits that you want to evaluate. Using your platform specific functionality, you can select multiple fits. Density (PDF) — Computes a probability density function. Cumulative probability (CDF) — Computes a cumulative probability function. Quantile (inverse CDF) — Computes a quantile (inverse CDF) function. Survivor function — Computes a survivor function. Cumulative hazard — Computes a cumulative hazard function. Hazard rate — Computes the hazard rate. At x = — Enter a vector of points or the name of a workspace variable containing a vector of points at which you want to evaluate the distribution function. If you change Function to Quantile (inverse CDF), the field name changes to At p =, and you enter a vector of probability values. The Distribution Fitter app cannot compute confidence bounds for nonparametric fits and for some parametric fits. In these cases, it returns NaN for the bounds. Level — Set the level for the confidence bounds. Plot function — Select this box to display a plot of the distribution function, evaluated at the points you enter in the At x = field, in a new window. The settings for Compute confidence bounds, Level, and Plot function do not affect the plots that are displayed in the main window of the Distribution Fitter app. The settings apply only to plots you create by clicking Plot function in the Evaluate window. To apply these evaluation settings to the selected fit, click Apply. The following figure shows the results of evaluating the cumulative density function for the fit My fit, at the points in the vector -4:1:6. X — The entries of the vector that you enter in At x = field. F(X)— The corresponding values of the CDF at the entries of X.
LB — The lower bounds for the confidence interval, if you select Compute confidence bounds. UB — The upper bounds for the confidence interval, if you select Compute confidence bounds. To save the data displayed in the table to a matrix in the MATLAB workspace, click Export to Workspace. To exclude values from fit, open the Exclude window by clicking the Exclude button. In the Exclude window, you can create rules for excluding specified data values. When you create a new fit in the New Fit window, you can use these rules to exclude data from the fit. Exclusion Rule Name— Enter a name for the exclusion rule. In the Lower limit: exclude data drop-down list, select <= or < and enter a scalar value in the field to the right. Depending on which operator you select, the app excludes from the fit any data values that are less than or equal to the scalar value, or less than the scalar value, respectively. In the Upper limit: exclude data drop-down list, select >= or > and enter a scalar value in the field to the right. Depending on which operator you select, the app excludes from the fit any data values that are greater than or equal to the scalar value, or greater than the scalar value, respectively. 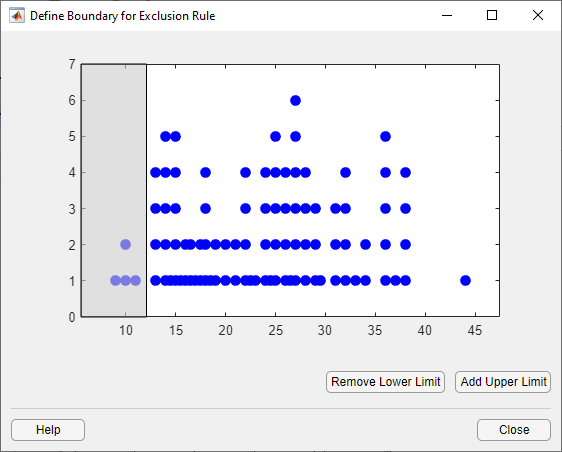 Click the Exclude Graphically button to define the exclusion rule by displaying a plot of the values in a data set and selecting the bounds for the excluded data. For example, if you created the data set My data as described in Create and Manage Data Sets, select it from the drop-down list next to Exclude graphically, and then click the Exclude graphically button. The app displays the values in My data in a new window. To set a lower limit for the boundary of the excluded region, click Add Lower Limit. The app displays a vertical line on the left side of the plot window. Move the line to the point you where you want the lower limit, as shown in the following figure. Move the vertical line to change the value displayed in the Lower limit: exclude data field in the Exclude window. The value displayed corresponds to the x-coordinate of the vertical line. Similarly, you can set the upper limit for the boundary of the excluded region by clicking Add Upper Limit, and then moving the vertical line that appears at the right side of the plot window. After setting the lower and upper limits, click Close and return to the Exclude window. 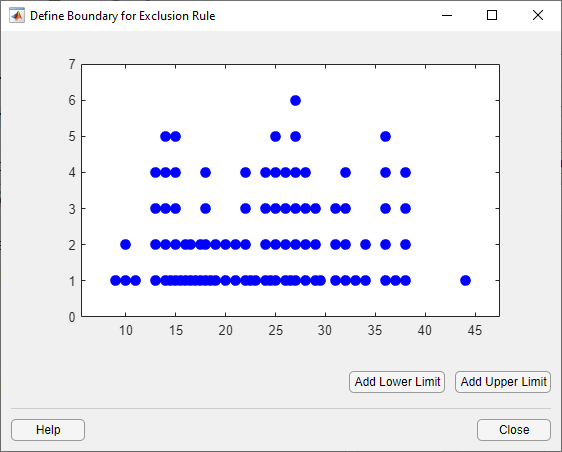 Create Exclusion Rule—Once you have set the lower and upper limits for the boundary of the excluded data, click Create Exclusion Rule to create the new rule. The name of the new rule appears in the Existing exclusion rules pane. Copy — Creates a copy of the rule, which you can then modify. To save the modified rule under a different name, click Create Exclusion Rule. View — Opens a new window in which you can see the data points excluded by the rule. The following figure shows a typical example. Rename — Rename the rule. Delete — Delete the rule. 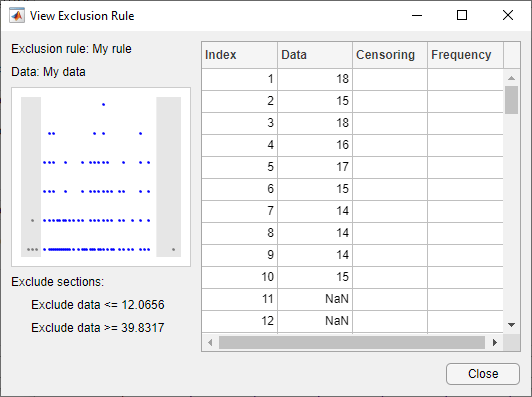 After you define an exclusion rule, you can use it when you fit a distribution to your data. The rule does not exclude points from the display of the data set. Save your work in the current session, and then load it in a subsequent session, so that you can continue working where you left off. To load a previously saved session, from the File menu in the main window, select Load Session. Enter the name of a previously saved session. Click Open to restore the information from the saved session to the current session. Fits the distributions in the current session to any data vector in the MATLAB workspace. Plots the data and the fits. After you end the current session, you can use the file to create plots in a standard MATLAB figure window, without reopening the Distribution Fitter app. From the File menu, select Generate Code. In the MATLAB Editor window, choose File > Save as. Save the file as normal_fit.m in a folder on the MATLAB path. generate newfit, a fitted normal distribution of the data. The commands also generate a plot of the data and the fit. By default, the file labels the data in the legend using the same name as the data set in the Distribution Fitter app. You can change the label using the legend command, as illustrated by the preceding example.